In Mandarin Chinese, the word “ma” can mean four different things depending on the tone (the pitch)—“mother,” “hemp,” “horse,” or “to scold”—even though the pronunciation is the same. If you are not a native speaker of Chinese, you may find this aspect of learning the language daunting. 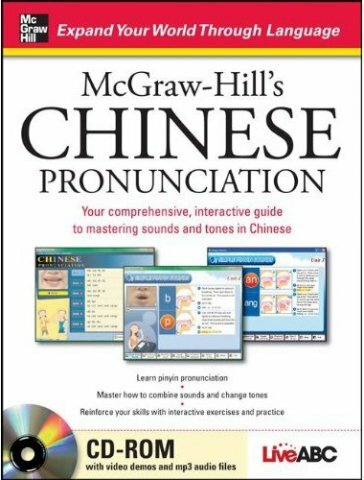 McGraw-Hill’s Chinese Pronunciation makes it easier for you to pronounce Chinese words correctly. You are first introduced to the simple sounds; you then learn their combinations and correct tones. Vibrant illustrations in the book and video demonstrations on the CD-ROM even show tongue placement and mouth shapes to help you get the words right. System requirements: PII, 256Mb, W98 or higher.